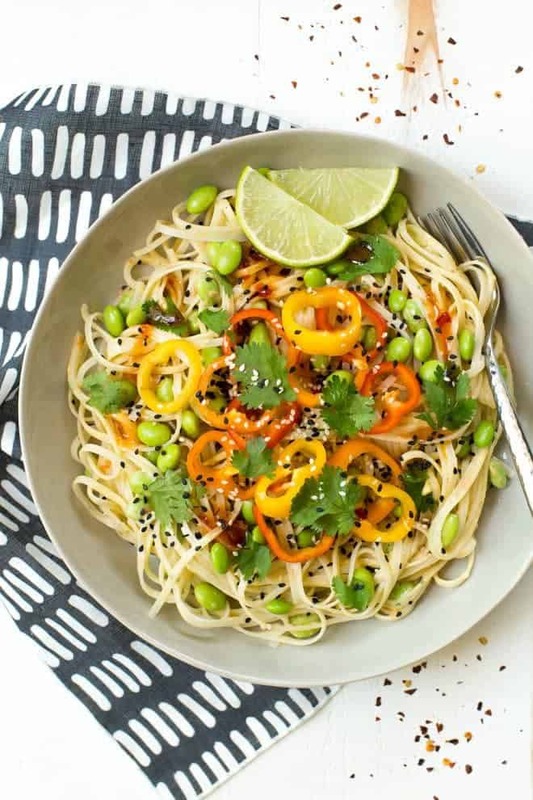 200Thai Mango Edamame Noodle Salad Bowls are a sweet and spicy meal packed with wholesome carbohydrates and plant-based protein! The entire meal comes together easily and is perfect for meal prep. Today I’m sharing a recipe from one of my favorite new cookbooks. 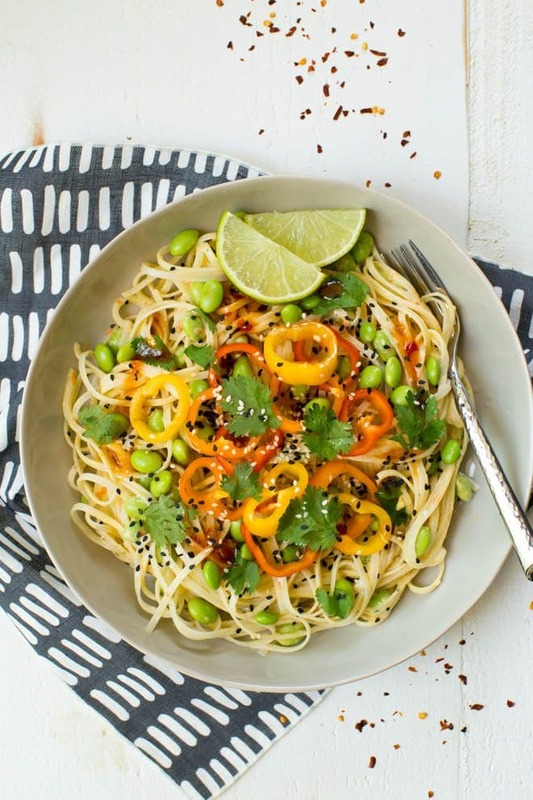 Lindsay Cotter’s new book, Nourishing Superfood Bowls features these Thai Mango Edamame Noodle Salad Bowls. You may know Lindsay from the popular gluten-free cooking blog Cotter Crunch. Her recipes are always a favorite to make for lunch and dinner because they are packed with wholesome nutrients and the freshest flavors. The new book features 75 healthy and delicious gluten-free meals for any day of the week. Many of the recipes are great for meal prep too! All of the recipes in Nourishing Superfood Bowls are gluten-free and many include vegan, paleo and dairy free options. 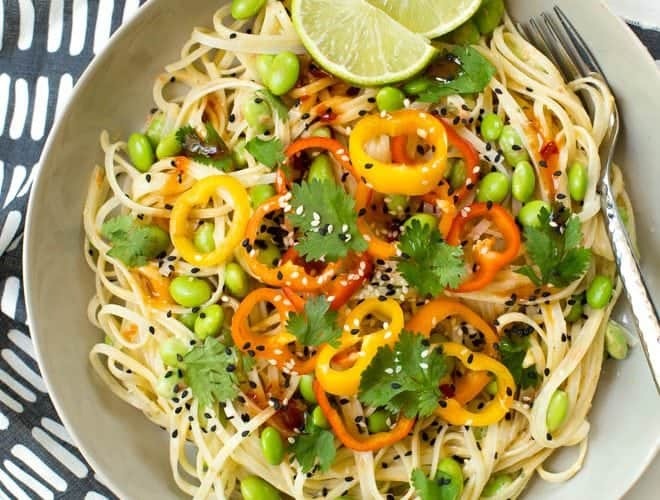 Packed with flavor, the Thai Mango Edamame Noodle Salad Bowls come together easily. My photos of this recipe does not do it justice. 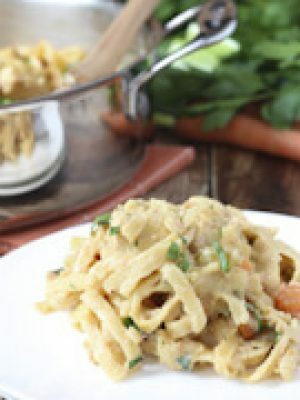 The sauce is the best part of this meal and tastes amazing! Combine fresh mango, avocado, cherry tomatoes and more of the freshest flavors to create the Thai mango sauce. The sauce elevates this dish from a simple meal with fresh ingredients to an amazing meal packed with superfoods and the best flavor. In addition to lunch and dinner recipes, the book includes breakfast and dessert recipes too. Find everything from Mexican Chocolate Almond “Nice” Cream Bowls to Loaded Sweet Potato Nacho Salad Bowls and more! 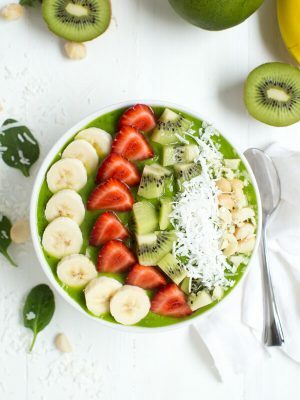 Click here to buy Nourishing Superfood Bowls by Lindsay Cotter on Amazon. 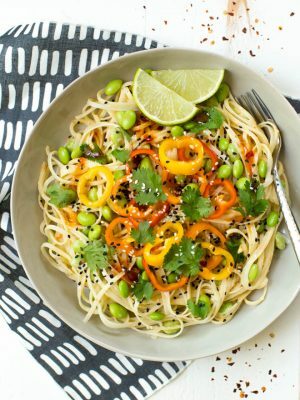 Thai Mango Edamame Noodle Salad Bowls are a sweet and spicy meal packed with wholesome carbohydrates and plant-based protein! 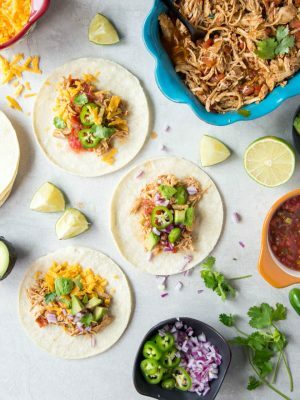 The entire meal comes together easily and is perfect for meal prep. To make the sauce, combine the mango, avocado, garlic, shallot, tomatoes, cilantro and yogurt in a food processor, blending until mixed. Add the Asian sweet red chili sauce, cumin and oil, and blend again. Taste, and add the salt and pepper to taste. Blend, then stop and scrape the sides if needed. Add a dash of lime juice. Blend once more until a creamy thick consistency is formed. For the bowls, soak the rice noodles in hot water for 30 minutes. Rinse with cold water and check for tenderness. If they are still not tender enough, place them in boiling water for 2 minutes. Rinse with cold water and place in a medium bowl with the edamame. Toss with 2/3 cup or more of the sauce. Divide evenly among the serving bowls. 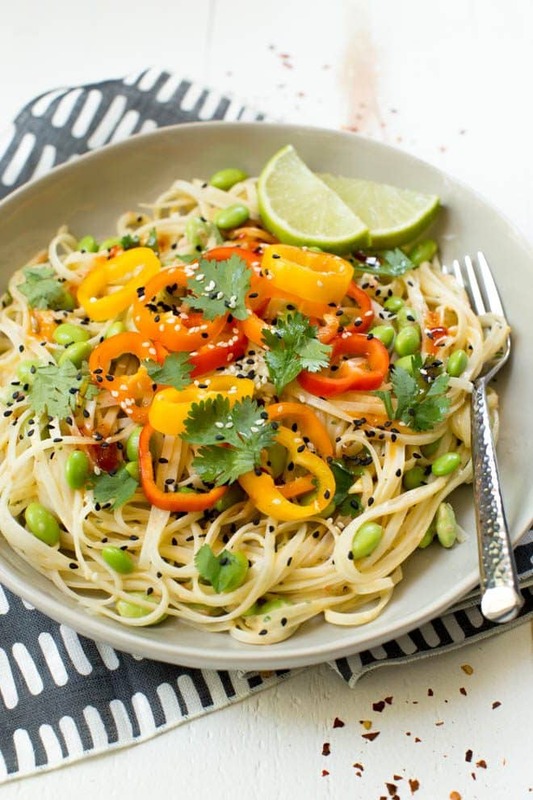 Top with the bell pepper, green onion, nuts, sesame seeds and cilantro. Drizzle with the tamari, a splash of lime juice, Thai sweet chili sauce and any extra reserved sauce, if desired. Season with salt. 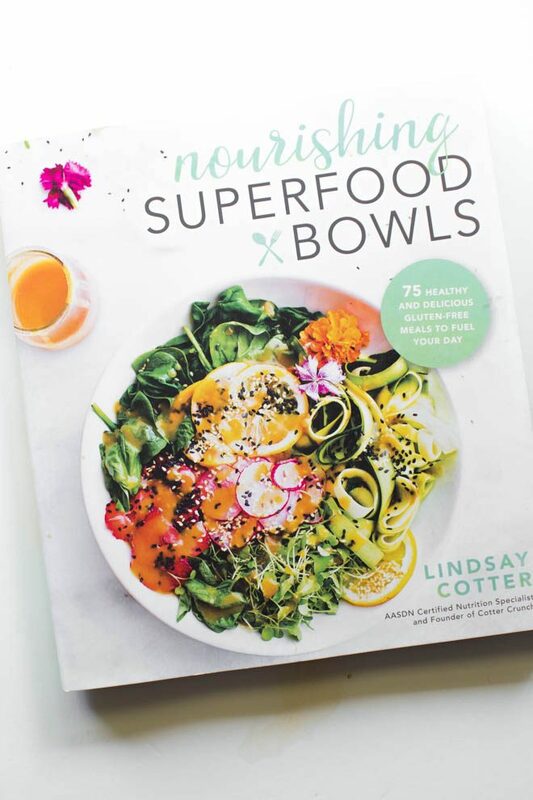 Nourishing Superfood Bowls by Lindsay Cotter, Page Street Publishing Co. Copyright © 2018. THank you friend! I am so so glad you enjoyed this! I cannot thank you enough for sharing with you readers. Truly! The bowls and photography look beautiful. Pass me a fork, mmm k?